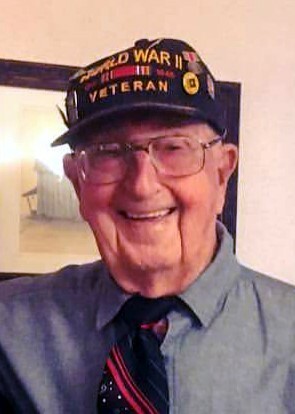 Carl R. Rogers, 97, of Romance, Arkansas went to be with the Lord January 13, 2019. He was a dedicated Christian who loved and faithfully served God. He was a devoted father, grandfather, brother and uncle. Family was everything to him which he continually proved that by his devotion and actions. He was an Army veteran of WWII, serving in Iceland. He was a retired heavy equipment operating engineer, a member of the Floyd – Romance Fire Department for over thirty years, and former owner of the Esso station in Beebe. Carl was a member of The American Legion, the Beebe Masonic Lodge, 32nd Degree Scottish Rites and a member of the Romance Church of Christ. He was proud of his community and worked hard to keep it a great place to live. Carl is survived by one brother, John (Shirley) Rogers of Beebe; two sisters, Ruth Cowgill of Searcy and Emma Reams of Romance; one grandson, Scotty R. Rogers (Leann) of Elkins; granddaughter Michelle (Jeff) Bowers of Bentonville; one great-grandson Cannon Rogers of Elkins; and three great granddaughters, Emma Rogers of Elkins and Lindsey and Kaylin Bowers of Bentonville. He was preceded in death by his wife Avis B. (Healy) Rogers, his son Richard Joseph “Dickie Joe” Rogers, his second wife Georgia Elaine (Witkowski) Rogers, and ten brothers and sisters. Memorials may be made to the Floyd – Romance Fire Dept., Romance Church of Christ or Romance Cemetery.